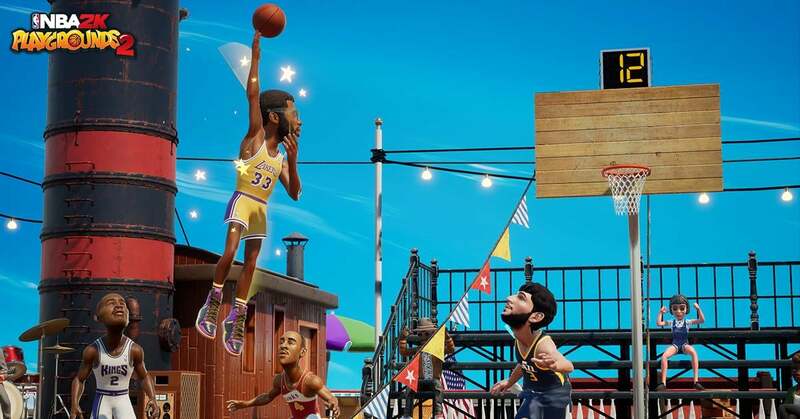 Last year's NBA Playgrounds made for a fun first effort in Saber Interactive's arcade basketball debut and if you liked that one, you'll love this year's sequel, NBA 2K Playgrounds 2. 2K Sports liked it enough to acquire the franchise under their publishing banner and after some playing time, it's easy to see why. It's better in nearly every way, offering more modes, more customization, and subtle improvements to the on-court gameplay that make this one of the best arcade sports game on the market. As soon as you hit the menus, improvements are apparent. The first game's simple and unattractive UI design is replaced with one that looks much slicker. This same feature extends to the gameplay too, where shot meters, scoreboards, and power-ups all look and behave on screen much more intuitively. These aesthetic improvements are supplemental to the more important gameplay upgrades. At first, the game may feel a lot like the original, but it plays a bit slower. Fast arcade gameplay may not sound like something that needs fixing, but here in the sequel, things are slowed just a bit, very subtly, to make the gameplay better. 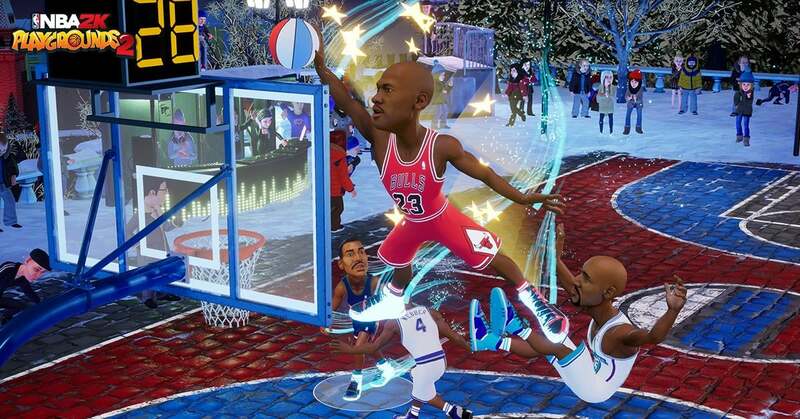 You'll still be nailing physics-defying slam dunks and jumping higher than the backboards, so the game hasn't lost its light-hearted, cartoony approach, only now the games allow for a bit more strategy, especially on defense, where in retrospect the game felt button-mashy when you didn't have the ball in your hands. An upgrade system is uniformly applied to all players, which demands you both play well and often with players whom you'd like to upgrade. As they level up from bronze all the way to diamond, you'll unlock new challenges that act as boosters to specific stats on the way. Chasing these upgrades is both very addicting and a lot of fun because the improvements become quite noticeable on the court. With so many players to choose from, everyone who likes the game will surely find a few players they grow attached to upgrading, while real diehards may try to improve a majority or even all of the roster. Exciting new modes are introduced too, like the ability to play anything in co-op, including an all-new 15-game season mode with best-of-three playoff brackets for 16 teams. 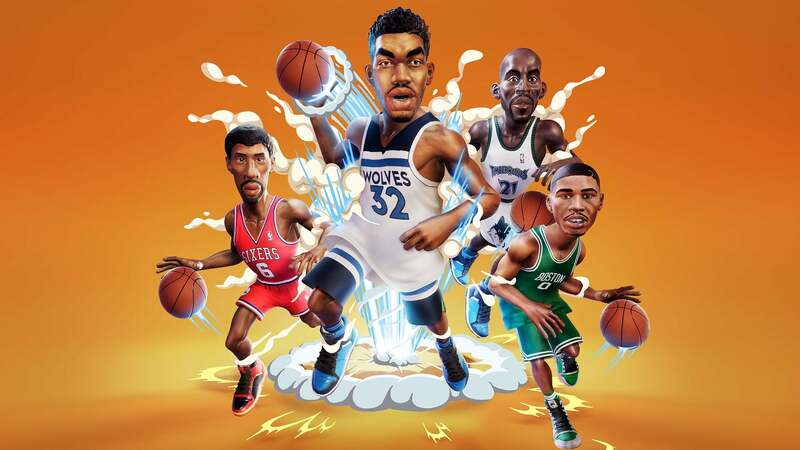 In season mode, you'll take two players from a team of your choice and unlock new players through winning the championship with that team, or unlocking player packs as you go. The season mode is especially fun because games are so quick and easy to jump into that it becomes very alluring to sit and play nearly a full season or more in a short amount of time. There's no seasonal mode online, but the rankings system from the first game returns to promote even-footed multiplayer. The original NBA Playgrounds was slow out of the gate to offer a well designed multiplayer suite, lacking even the option to invite friends to your game directly. Thankfully, this time around the game comes with every option you'd expect. You can play random opponents in ranked or unranked play as well as invite friends for co-op or competitive modes. The same exaggerated visual style returns and even the soundtrack is mostly the same, but it's worth noting one upgrade to the audio comes by way of improved commentary. Ian Eagle is back and does well as the play-by-play guy making just enough light of what's going on in the game. Joining him are also a host of online streaming personalities, some of whom first appeared as free DLC players in the original game. Now they're back as commentators and if you take the time to cycle through them, it keeps the commentary fresh for a while longer than you'd really expect for this sort of game. Several new courts take the caricatured players globetrotting again. The roster is once again impressive with only a few notable absences at launch and with plans to add more as the game lives on, just like the original did. Player acquisitions are the one glaring blemish on this year's game as they seem to trickle out more slowly than before. The first game offered no microtransactions and player card packs were earned regularly in-game. You can still keep your wallets and purses closed if you'd like, but there's also a one-time purchase option to immediately unlock the entire roster, including future updated players. This is the only real money purchase option outside of new cosmetic packs that let your players dress more casually, or sometimes ridiculously, compared to their jerseys. You can even unlock specific players of your choosing with the free currency, but just one of these characters will cost you at least double the price of the most expensive random pack. If you elect not to spend real money, the grind for packs isn't intolerable, just noticeably slower, which leads one to wonder if they really want to sell that roster unlock. The achievement list contains just 13 total unlocks to chase and several of them will just come with time, like winning a championship or opening 25 card packs. The hardest of them are to win a season on the hardest difficulty (hint: bring a competent co-op buddy) and to score 33 or more in a three-point shootout, which will require a nearly perfect round. This one will get easier if you first upgrade an already great player beyond the arc and work on his challenge boosters. I'd recommend Steve Nash or Larry Bird if you unlock them. There are no strictly online achievements so you needn't worry about any eventual server issues, although several achievements could be boosted online if you prefer. NBA 2K Playgrounds 2 takes a fun foundational first game and improves on it in nearly every way. With subtle touches to the on-court gameplay, better and more numerous game modes, and an addicting player upgrade loop, it's a tough game to put down. The noticeably slower player unlocks are annoying, but given that the only purchasable player pack is a one-time full roster unlock, it doesn't end up seeming so predatory, just grindy otherwise. 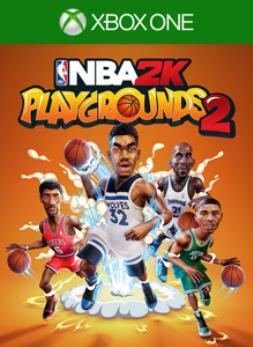 For basketball fans that don't always want the true-to-life simulation of the mainline 2K series, NBA 2K Playgrounds 2 is a slam dunk. The reviewer spent six to seven hours on the absurd playgrounds playing streetball with big-headed superstars from the NBA. He gathered 5 of 13 achievements and is on the path to back-to-back championships. A review code was provided by the publisher and the game was played on an Xbox One S.